Exit at the end of each trading session. Not doing so could adversely affect how you see your position at the beginning of the next trading session. From the Control Panel, click the File menu and choose Exit. In the top right-hand corner of the Control Panel, click the Windows Exit button. Note: If you have working orders in the market, you are prompted. At that time you can choose to continue exiting, or return to and resolve them. 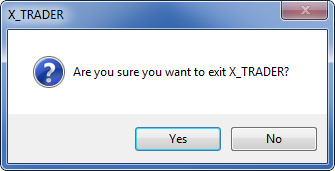 You are prompted to confirm the exit. Click Yes.